Often labelled ‘late season’, March and April ski holidays are when you can truly revel in the joys of ski seasons at the peak of their powers. Contrary to many beliefs, the snow doesn’t all melt when the ski lifts close in April! In fact, a quick search online will prove that March is historically the snowiest month in many ski resorts in the Northern hemisphere including the Alps and the Rocky Mountains of the USA and Canada. From personal experience of ski seasons in Europe and North America, the best skiing conditions frequently and consistently occur towards the end of March and well into April. From the darkest of days, the Winter Solstice on December 22nd, the Northern Hemisphere starts to receive more and more sunlight. In Alpine regions, the appearance of the sun earlier and later in the day is incredibly energising, and by mid-March you’re regularly spoilt by wonderful evening Alpenglow on neighbouring mountain ranges whilst basking in glorious sunshine at après bars and sun terraces after the lifts are closed. This is the time of year that ski holidays were made for! A suntan on a ski holiday? Surely not! But anyone who’s been spring-skiing in March and April knows that a goggle-tan (or panda-eyes) is a priceless souvenir, and unequivocal proof of a trip to the mountains! It’s certainly true that ski resorts enjoy more intense sunshine as spring approaches throughout March. A warm afternoon in a resort village in just a t-shirt after a powder day is not uncommon on March and April ski holidays, meaning you can go home bronzed as well as with loads of snow down your pants! More frequent snow days, more intense snowfall, higher volume of snow, more bluebird powder days, snowy nights and sunny days, less white-outs, warmer days… – These are the elements many of us look for when deciding where and when to go skiing. But is there a holy grail that ties them all together? These elements seem to align more frequently in lots of ski resorts in spring, resulting in excellent conditions. This means that overall, you’re more likely to have ‘the best ever day skiing’ in March and April, than any other months! Barring the occasional early Easter, March is the only month of the ski season which doesn’t entertain a UK school holiday of some kind [No, November doesn’t count as the “ski season” – Ed]. Ask any seasonaire and they’ll tell you the slopes are much quieter in March and April because of it, even taking Easter into account. This means more space on the slopes, shorter lift-lines and less queuing for lunch or jostling for service at the slope-side bars. All-in-all this equates to more time actually skiing – which is why you’re going on a ski holiday in the first place! Far be it for a ski holiday company to divulge secrets about when the best ski deals are, but it’s well worth noting that March and April ski holidays have their fair share. You could decide to book really early and take advantage of a Ski-All-In Deal or maybe a lift pass offer, or pounce on a 50% off Chalet Deal in the January Sale, or maybe you book a Last Minute Ski Deal. Either way, spring dates feature heavily. A basic rule of thumb is the later in March or April you go, the better the deal. If you don’t believe us, check out the latest Half Price Chalet Flash Sale! 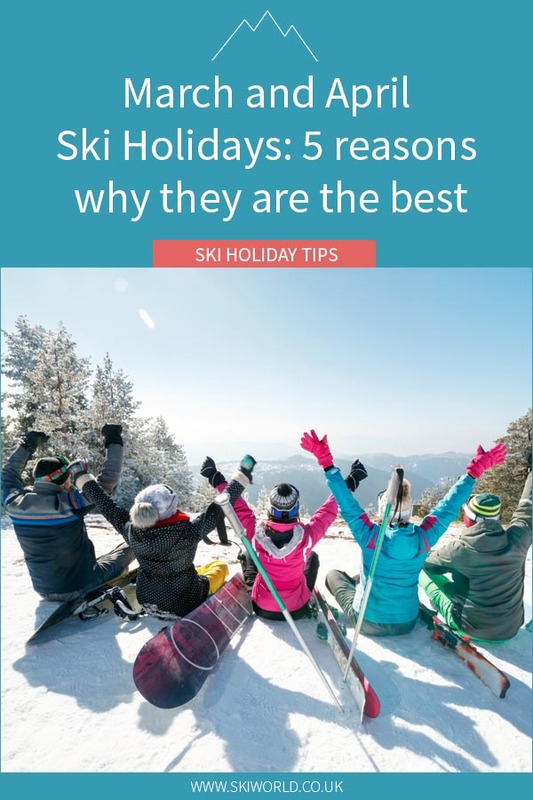 Share the post "March and April Ski Holidays: 5 reasons why they are the best"